DISNEYVILLE: MICKEY MOUSE'S 80TH "BIRTHDAY"
Today is regarded as the 80th "birthday" of Mickey Mouse, as it is the 80th anniversary of the release of cartoon short Steamboat Willie featuring Mickey (and Minnie) Mouse. 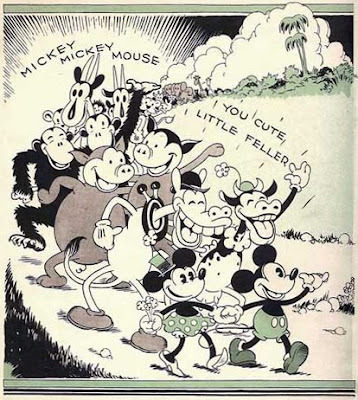 Well, Steamboat Willie was not actually the first-ever Mickey Mouse cartoon in terms of production chronology: there were two others made before it, but they had been shelved after previews. In any case, for convenience sake, I also follow the custom of taking Nov.18th as Mickey's "birthday" and start this blog to commomerate it. Here you shall find nice scans and infos about vintage Disney comics and illustrated story books. Come back soon.